Visit Beautiful Khao Lak in Southern Thailand, on the exquisite Andaman Sea! one diving departure point for the Similan Islands. Nights here are quiet, so this is also a great place to bring the family. Visitors can enjoy Khao Lak on the beach, explore the land, or experience the beautiful seascapes under the water. The nearest Airport is the Phuket International Airport and is rated one of the top airports to use when visiting Thailand. 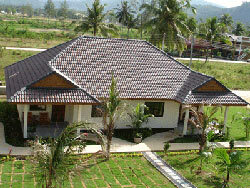 The airport conveniently located only eighty minutes south of Khao Lak. Visitors can fly into Phuket, and travel north by car, bus or taxi to find Khao Lak and Cousin Resort. 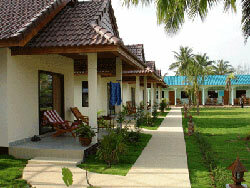 Cousin Resort also features pickup service from Phuket International Airport. Khao Lak truly is a lush tropical paradise. The restaurants and other beaches are within easy reach of Cousin Resort. Some restaurants in the area are geared more geared toward westerners, whereas others feature traditional Thai food. So, whether you are looking to experience the local flavor, or prefer the types of foods you are used to, you can find what you are looking for in and around Khao Lak. 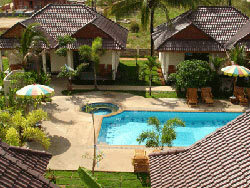 Cousin Resort is located in beautiful Khao Lak, Bang Niang, just 70 kilometers north of Phuket International Airport. Conveniently located just a 100 meter walk from the beaches of the Andaman Sea, Cousin Resort is your new, Far Eastern destination for resort accommodations. The medium sized swimming pool is very popular. 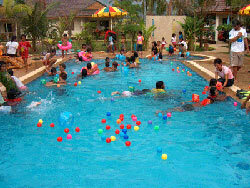 In the children area the youngsters enjoy playing, while the parents swim a few rounds or indulge in the Jacuzzi basin. There are enough reclining chairs for every guest. They consist of two modern sleeping rooms with airconditioning, two bathrooms with shower and warm water, plus a living room with relax corner, fridge and coffee machine. From the terrace there is a nice view of the pool or the tropical garden. 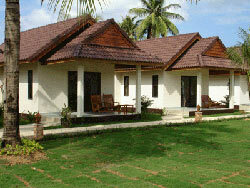 Cousin Resort features detached and semi-detached bungalows. Choose from either Air Conditioned or Fan rooms. If you are bringing the family, ask about our Family Suites which have a sitting room with sofa. 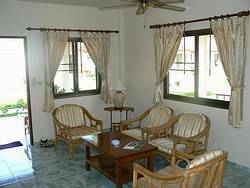 Spacious room with two twin sized beds, overhead fan, bathroom with hot shower, refrigerator and balcony. 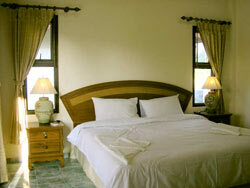 Spacious room with two twin sized beds, air conditioning, bathroom with hot shower, refrigerator and balcony. Spacious room with one king sized bed, air conditioning, bathroom with hot shower, refrigerator and balcony. Two spacious rooms: One with one king sized bed, the other room with two twin beds, air conditioning, sitting room with sofa, bathroom with hot shower, refrigerator and balcony.